CrochetSal's: It's a New Year! And after being unable to keep my eyes open past 9:30 (waking up early to go to work!! ), I was able to welcome the new year Wednesday night. Not that I made it a resolution (I always break those! ), but I am trying to update my blog more often. And feature more of my fellow Etsians. Please note: these pictures are copyrighted and are used here with permission from DesignsByWho. Do NOT copy and use them elsewhere without contacting her for permission. First of which is DesignsByWho. 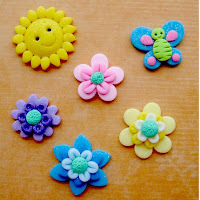 A wonderful seller, and beautiful work in polymer clay! 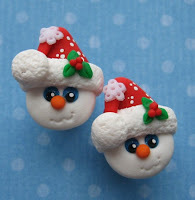 And after purchasing my special listing, I found an equally cute pair of Santa earrings that I just had to have. If you like these earrings, click on the pic, there is a similar pair in blue available--if it's sold when you check it out, try contacting Dee for a special order. 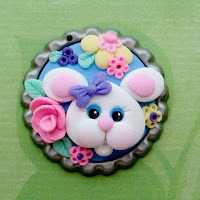 With Christmas behind us, DesignsByWho has some spring and Easter themed treasures already listed, click on the pict ures to see the listing, and don't forget to check out the rest of her shop! *blushing* Thank you so much for featuring me! It's always so exciting to see yourself on someone elses blog! Your ornaments are so cute!! I love crocheting, but have only mastered simple stuff like scarfs, or a blanket, basically straight lines, lol.